The death toll from the collapse of an apartment building in Istanbul rose to 21 Saturday, as President Recep Tayyip Erdogan said authorities have “lessons to learn” from the incident. The eight-storey block in the Kartal district on the Asian side of the city collapsed on Wednesday but the cause is not yet clear. Erdogan, visiting the site Saturday, said: “We have a great number of lessons to learn from this. 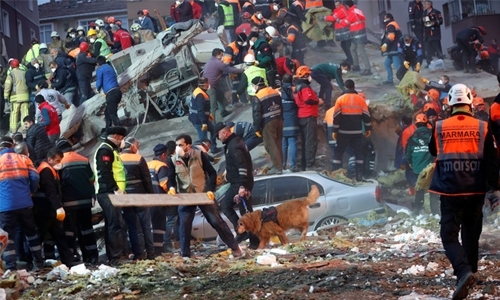 We will take the necessary measures.” Interior Minister Suleyman Soylu, meanwhile, told reporters that the toll from the building collapse had risen to 21 dead and 14 injured.